Mustafa Kemal Atatürk was born in a three-storey pink house at Islahhane Street, Kocakasim District, Salonika in 1881. His father was Ali Riza Efendi and mother was Zübeyde Hanim. His paternal grand father Hafiz Efendi is a member of Kocacik Nomads from Konya and Aydin region, which was settled in Macedonia during 14th-15th centuries. His mother Zübeyde Hanim, also a daughter of an old Turkish family, settled in the town of Langasa near Salonika. Ali Riza Efendi who worked in various areas such as; a military officer, a pious foundation clerk and for some time a timber merchant and got married with Zübeyde Hanim in 1871. Four of Atatürk's five siblings died at an early age, only his sister Makbule Atadan survived and lived until 1956. Little Mustafa commenced his education in Hafiz Mehmet Efendi's neighbourhood school, later he was transferred to Semsi Efendi School, because his father wished so (Comparatively modern education at the time.) During his primary education, he lost his father in 1888. For a while he stayed on his uncle's farm in Rapla, returned to Salonika and completed his primary education. He enrolled to Salonika Junior High School for Civil Servants. After a short time in 1893, he transferred to Military Junior High School. It is at this school his math teacher Mustafa Bey, added Kemal to his name in between 1896-1899, Mustafa Kemal finished Monastir Military Senior High School and commenced Military College in Istanbul. In 1902 he graduated with the rank of lieutenant and continued his education in Military Academy. In January 1905 he completed the Academy and graduated with the rank of a captain. His first appointment was in 5 Army in Damascus in between 1905-1907. He was promoted to adjutant major in 1907 and appointed to 3 Army in Monastery. He was the Chief of Staff of the Army Corps which entered Istanbul on 19 April 1909. He was sent to France in 1910 and took part in Picardie Manoeuvres. In 1911 he was back in Istanbul and started to work under the Command of General Staff. Mustafa Kemal and a group of friends took part in Tobruk and Derna Fronts during the war which started in 1911 against the Italians who were attacking Tripoli (Libya). He won the Battle of Tobruk against the Italian forces on 22 December 1911. He was then appointed to Derna Front as the Commander-in-Chief on 6 March 1912. When the Balkan War started in October 1912, Mustafa Kemal joined the battle with units in Gelibolu (Gallipoli) and Bolayir. He greatly contributed to the retrieval of Edirne and Dimetoka (Dhidhimotikhon). In 1913 he was appointed to Sofia as the military attache. During his assignment in Sofia he was promoted to lieutenant-colonel. His duty as the military attache ended in January 1915. During his stay in Sofia, the First World War had started and the Ottoman Empire had become obliged to enter in this war. Mustafa Kemal was appointed to Tekirdag to organize the 19 Division. It is in the First World War, which started in 1914, that Mustafa Kemal wrote an heroic epic and made the legend of Dardanelles are Impassable against Entente troops in Gallipoli. On 18 March 1915, when British and French navies failed to break in through the Straits of Dardanelles with heavy losses, the decision to land troops on the Gallipoli peninsula had been given. Under the command of Mustafa Kemal, 19 Division halted the enemy forces, which landed in Ariburnu -now called Anzak Koyu (Anzac Cove)- on 25 April 1915 at Conkbayir. Mustafa Kemal was promoted to full colonel after this great success. British forces started attacking again from Ariburnu on 6-7 August 1915. Anafartalar Group Commander Mustafa Kemal won the victory of Battle of Anafartalar on 9-10 August. Following this, he also won the victories of Battle of Kirectepe on 17 August and Second Battle of Anafartalar on 21 August. The Turkish nation defended her honour in Gallipoli (Battle of Canakkale) against Entente States by losing approximately 253,000 of her sons to martyrdom. Mustafa Kemal's famous order to his soldiers "I do not order you to attack, I order you to die", had changed the destiny of this Front. In 1916 after Gallipoli, Mustafa Kemal took duties in Edirne and in Diyarbakir. He was promoted to brigadier general in 1 April 1916. He took part in the battles against Russian forces by which Mus and Bitlis were liberated. After short duties in Damascus and Aleppo, he returned to Istanbul in 1917. He went to Germany with Heir Apparent Prince Vahdeddin Efendi for observations in the European Western Front. He became sick after this trip and received treatment in Vienna and Carlsbad. He returned to the Front on 15 August 1918 as the Commander-in-Chief of the 7 Army in Aleppo. At this front he achieved the most successful defensive battles in history against the British forces. He was appointed as the Commander-in-Chief of the Lightning Army Group on 31 October 1918, just one day after the signing of the truce in Moudros. After the abolishment of this Army Group he was appointed for a duty in the Ministry of War in Istanbul on 13 November 1918. After the beginning of the occupation of the country and demobilization of the Ottoman armies according to the Moudros Truce, Mustafa Kemal arrived in Samsun on 19 May 1919 as the Inspector General of the 9 Army. 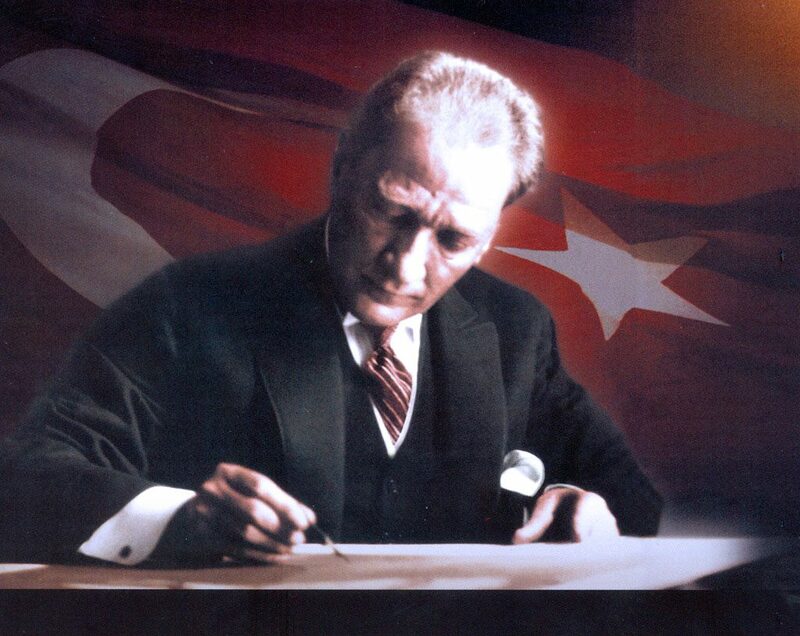 On 22 June 1919, he issued the Amasya Circular, declaring that the nation's determination and decision will restore the nation's independence and called for the gathering of Congress in Erzurum and Sivas. Between 23 July and 7 August 1919 delegates from all over the country gathered in Erzurum and then between 4 September and 11 September 1919 in Sivas, determining the path to follow in order to gain nation’s independence. On 27 December 1919 he was welcomed in Ankara with great enthusiasm. 23 April 1920, the first day of the Turkish Grand National Assembly, was one of the very important steps on the way to the founding of the Turkish Republic. Mustafa Kemal was elected as the first Speaker of the House and the Head of the Government. The Turkish Grand National Assembly started preparing and passing the new laws necessary for implementing the Independence War successfully. The Turkish Independence War was started when the first bullet was fired against the enemy during the occupation of Izmir by the Greek forces on 15 May 1919. Victors of the First World War, by signing of the Sevres Agreement, started the occupation of their shares of the Ottoman Empire. At the beginning, resistance against occupation forces started with militia forces, namely Kuva-i Milliye (National Forces). The Turkish Grand National Assembly established the regular army and successfully led the Independence War to victory by integrating the militia forces into the regular army. • Liberation of Sarikamis (20 September 1920), Kars (30 October 1920) and Gümrü (7 November 1920). • Defences of Cukurova, Gaziantep, Sanliurfa and Kahraman Maras (1919-1920). • Victory at the Second Battle of Inönü (23 March-1 April 1920). • Victory at the Battle of Sakarya (23 August-13 September 1921). • Great Offensive, Battle of Dumlupinar (Battle of Commander-in-Chief) and the Great (Final) Victory (26 August-9 September 1922). After the victory at the Battle of Sakarya, the Turkish Grand National Assembly promoted Mustafa Kemal to the rank of Field Marshal and granted him the title of Gazi-the Victorious Fighter. The Independence War was ended by the Lausanne Peace Treaty on 24 July 1923. Thus, all the impediments of the Sevres Agreement had been removed and integrity of the Turkish land had been accomplished by the signing of the Lausanne Agreement. There were no obstructions left on the way to establish the new Turkish State based on national solidarity. Founding of the Turkish Republic had been heralded by the opening of the Turkish Grand National Assembly on 23 April 1920. National Assembly's successful administration during the Independence War had secured the founding of the new Turkish State. Caliphate and Sultanate (monarchy) separated and Sultanate was abolished on 1 November 1922. Therefore, the administrative ties with the Ottoman Empire were broken. The declaration of Republic was made on 29 October 1923 and Mustafa Kemal was unanimously elected as the first President of the Republic. Ismet Inönü formed the first government of the Republic on 30 October 1923. Sovereignty unconditionally belongs to Nation and Peace at home, peace in the world are the raising fundamentals of the Turkish Republic. In accordance with the new surname law, Turkish Grand National Assembly granted Mustafa Kemal with the surname Atatürk on 24 November 1934. Atatürk had been elected twice as the Speaker of the House (National Assembly), on 24 April 1920 and 13 Augustus 1923. His chairmanship at that time, was equal to the Head of State and the Government combined. On 29 October 1923 Republic was declared and Atatürk was elected as the first President of the Republic. According to the Constitution Presidential elections held for every four years. Atatürk had been re-elected as the President of the Republic in 1927, 1931 and 1935 by the Turkish Grand National Assembly. Atatürk very frequently used to go for fact-finding trips in the country. He kept in contact with local authorities and directed them personally in every occasion. In the capacity of the President of the Republic, he received the visiting foreign presidents, premiers, ministers and commanders with great respect and authority. Atatürk gave his Great Speech on 15-20 October 1927 in which he described the Independence War and Founding of Republic, he then made his 10th Year Speech on 29 October 1933. Atatürk was very modest in his private life. He married with Latife Hanim on 29 January 1923. Together they had many trips around the country. Their marriage lasted until 5 August 1925. As a great lover of children, Atatürk adopted his daughters Afet (Inan), Sabiha (Gökcen), Fikriye, Ülkü, Nebile, Rukiye, Zehra and his son Mustafa, a young shepherd boy. He also had two children under his protection, Abdurrahim and Ihsan. He secured a good life and future for these children who survived. In 1937, he donated his farms to the State Treasury and some of his real estate to Ankara and Bursa Municipality Councils. He divided his inheritance among his sister, his adopted children and the Turkish Language and Historical Societies. He enjoyed reading, listening music, dancing, horse riding and swimming. He was very much interested in the Western Anatolian folk dance Zeybek, wrestling and listening to Rumelia songs. He had great pleasure in playing black-gammon and billiards. He valued very much his horse Sakarya and his dog Fox. He had made up a very rich library of his own. He used to invite statesmen, scholars and scientists to dinners and discuss state affairs with them. He was very particular about his appearance and was smartly dressed all the times. He was also a nature lover. He very often used to visit his farm Atatürk Orman Ciftligi-Atatürk Forest Farm and took part at works in person. Atatürk was proficient in French and German. On 10 November 1938 at 9.05 in the morning, in Istanbul, Dolmabahce Palace, he died of the liver ailment he was suffering from. He was buried with a ceremonial funeral in a temporary place of rest at the Ethnographical Museum in Ankara on 21 November 1938. After the building of Anitkabir (Atatürk Mausoleum) he was taken to his permanent place of rest with a grand ceremony on 10 November 1953. Mehmed II, also known as The Conqueror is one of the famous sultans of Ottoman Empire with his intelligence. Mehmed II ruled the Ottoman for a brief time, from 1444 to 1446, after his father. After that time Sultan Murad II renounced the throne but when he died Mehmed II ruled the Ottoman Empire from 1451 to 1481. Mehmet II was a genius statesman and a military leader who was also interested in literature, fine arts and monumental architecture. He was educated by famous scholar Aksemseddin and according to Ottoman historians he was speaking seven languages fluently. Mehmed II was born as a son of Sultan Murad I and Huma Hatun on the night of 29th binded to 30th March 1432, in Edirne. His early childhood passed on Edirne for a while. 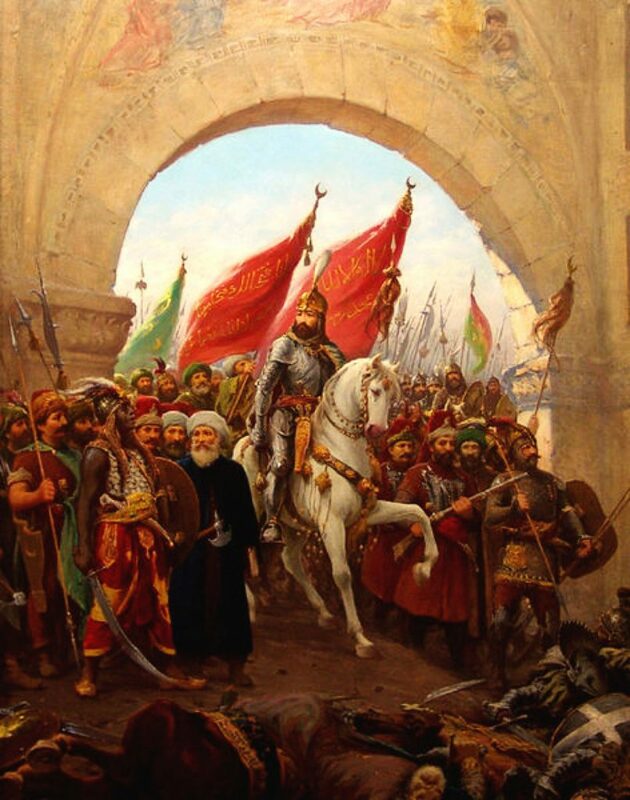 Mehmed II motivated for taking the city of Constantinople by Prophet Hz Muhammed’s words for the conqueror of Constantinople decades ago; “One day, Constantinople will be conquered. How wonderful and blessed are the commander of its conquest and his soldiers!” Sultan Mehmed II, overthrew the Byzantine Empire by conquering Constantinople as consolidating the Ottoman Empire and marking the end of the Middle Ages. He took the name “conqueror” (fatih) after the conquest of Istanbul on 29th May 1453. The conquest of Istanbul spelled the end of the Byzantine Empire and entered a phase of urban revival under the wise and tolerant administrations of Mehmed and his immediate successors. The capture of Istanbul was followed by a long succession of campaigns which resulted in a tremendous extension of direct Ottoman rule. After the conquest of the city, Mehmed the Conqueror marched towards Morea and captured the cities of Greece one after another. However, he was threatened from the rear by the principality of Karaman and therefore turned to Anatolia to vanquish them and to annex their territory. He then conquered the area close to western Black Sea and appointed as governor Kızıl Ahmet who was the founder of the principality Isfen-diyar. Afterwards, he fought Uzun Hasan, the ruler of the Akkoyunlus and overcame him.Among those areas that fell to Mehmet II were Serbia, Greece, the Empire of Trezibizond, Wallachia, Bosnia, Karaman, Albania and several Venetian and Geneose maritime establishments. Mehmed 2nd’s wifes were Gulbahar Hatun, Gulshah Hatun, Sitti Mukrime Hatun, Cicek Hatun, Helene Hatun, Anna Hatun and Alexias Hatun. He had a daughter named Gevrehan Sultana and sons; Mustafa, Bayezid II (Sultan after Mehmed II), Cem and Korkut. Mehmed II was dressed in the simple and heroic manner of his great grandfather Çelebi Mehmed. His turban consisted of a ‘’mücevveze’’ (a tall cylindrical headgear) in military style, wound round with coiled gauze. This special type of turban became fashionable among later sultans. The Codes of Laws of Mehmed II was very important document for his era. It was a constitution ordering the state men duties and legalizing the fratricide for the order of the empire. This code included establishing various organizational positions, produce a form of law that suited the growing empire’s geography and state organizations after the conquest of Constantinople. He ruled the Ottoman Empire for 30 years and joined 25 campaigns himself. He was a very strict statesman and a very brave soldier. The great emperor had died on 3rd May 1481 and he was buried in “Fatih Turbesi” (tomb), near the Mosque of Fatih in Istanbul. After the Sultan’s death, the Ottoman Empire remained culturally and geographically strong. Sinan died in 1588 and was buried in a modest tomb, which he designed for himself at the rear of his garden near the Suleymaniye Mosque in Istanbul. Hz. Mevlâna Celaleddin-i Rumi, the founder of the Mevlevi Order, is the great Anatolian theologian, scholar, and poet. Known as Hz. Mevlâna in the East and as Rumi in the West, his birth name was Mohammed, and he was later nicknamed "Celaleddin". The name “Mevlâna”, meaning “our master”, was given to him in Konya, Turkey. The name “Rumi” relates to “the land of Rum (Roman)”, referring to “Anatolia”, where he lived and died. Hz. Mevlâna was born on 30 September 1207 in Balkh, Horasan (today's Afghanistan). His mother, Mümine, was the daughter of Rükneddin, the sovereign ruler (emir) of Balkh. At a very early age, Mevlâna received his first lessons from his father, Bahaeddin Veled, who was the chief scholar (Sultan-ül Ulema). He also took lessons from Seyyid Burhaneddin Tirmizi and other top scholars of the time. 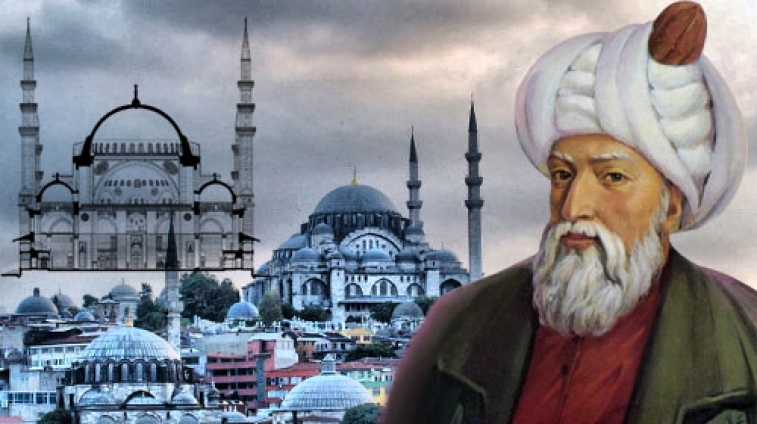 He learned Turkish, Arabic, Persian, Greek, and was well educated in many subjects from history to medicine. Along with Islam, he studied the other religions and pursued the divine truth and secrets. Because of an expected Mongol invasion, the whole family had to leave their hometown of Balkh around 1212 (or 1213). His father's disagreement with Fahreddin-i Razi, one of his contemporary theologians was also a factor in his decision to leave. When Mevlâna was 6 years of age he began the long journey with his family and exceptional scholars, which would end in 1228 at the age of 21. By today's norms, this period of life between the ages of 6 and 21 covers a full formal education. A comprehensive social, cultural, linguistic, and geographical experience in many different countries on their journey, enhanced byl one-on-one tutors under a chief scholar contributed greatly to forming a brilliant person, who would have the capacity to understand, to appreciate, and to make use of such an incredible education. They first went to Mecca, (in Saudi Arabia) for hadj, the Islamic pilgrimage, by way of Baghdad (in Iraq). After staying in Damascus and many towns in Anatolia, they arrived in Karaman (in Turkey) in 1222, where they stayed for seven years. At the age of 18 in 1225, he married Gevher Hatun, who gave him two sons. Upon the unfortunate death of Gevher, Mevlâna married Kerra Hatun, who also gave him three children, two sons and a daughter. The Great Seljuk Empire (1037-1194), the other Turkish Empire and the predecessor to the Ottoman Empire, was then dominating Anatolia. As the capital city of the Seljuks, Konya was very popular and the center of art and science. The city, therefore, was full of artists and scholars. Upon receiving an invitation from Alâeddîn Keykubad, the Seljuk Sultan, the travel of Bahaeddin Veled, his son and their group ended up in Konya on 3 May 1228. They settled on the land, which was originally a rose garden. This contribution of the Sultan's thereby became the current location of the Mevlevi Order. Almost 16 years after they left their hometown, the group arrived at their final destination. 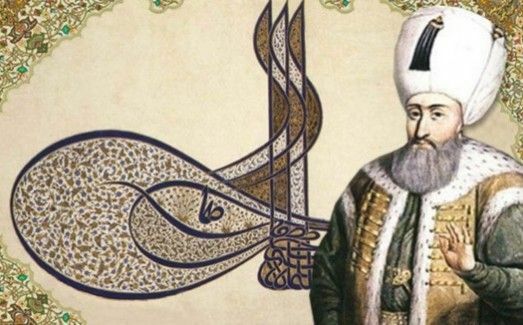 There was one more important mission for Bahaeddin Veled, the chief scholar (Sultan-ül Ulema): the orientation of his family and his followers to their new hometown, Konya. It took almost three years, but he successfully completed his last mission too. When he died in 1231, he left human beings a gift, a child, who has been revered for 800 years. Mevlâna was 24 and was ready to continue his future alone. "I saw countless people with no clothing on. Mevlâna had been granted valuable knowledge until age 37, but nothing was enough for him. One of the most important scholars of that time, from whom Mevlâna was inspired, was Shems-i Tebrizi. Rumi spent a long time alone with Tebrizi, who had a similar background. Mevlâna Rumi and Tebrizi met in Konya in 1244. These two genius philosophers inspired each other, synthesized their philosophies and thus found answers together to the questions that would be impossible to find on their own. Upon the sudden and disputed disappearance of Shems-i Tebrizi, Hz. Mevlâna entered a new stage in his life. Because of his deep sorrow, he isolated himself from his circle and even appointed Hüsameddin Çelebi (Chalabi), one of his own students, to teach on his behalf. Hz. 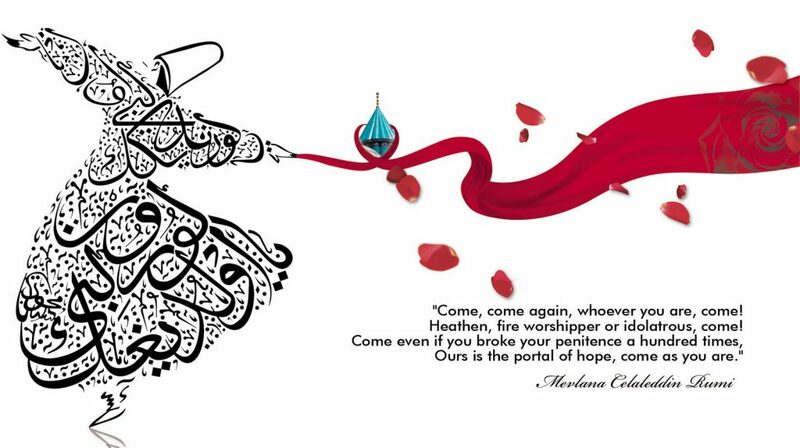 Mevlâna Celaleddin-i Rumi passed away on 17 December 1273 at the age 67. The night of his death was named Shab-i Arus(The Night of Union with the Divine). Every year the Mevlevi dervishes observe that day as a festival. There are only a few such unique and gifted people in history who knew how to listen, understand, and communicate with so many people in their own language and culture. The other way around is also true for Mevlâna: that people from all over the world now understand and adore him. Erdogan, Erol. Director of the Mevlâna Museum. Mevlâna Rumi produced many valuable literary works. After his death, the works of Mevlâna were compiled by his family members and followers; especially Hüsameddin Çelebi. The Mesnevi, narrated in story forms, consists of 26 thousand couplets (two successive lines of verse) in six volumes. Mesnevi is a special form of old eastern classical literature. Mevlâna's Mesnevi, written in Persian, inspired many Turkish poets in later centuries, even though those poets did not follow the Mevlevi Order. The Divan-i Kebir (Great Divan) consists of 40 thousand couplets with 21 divans. These divan poems are on various themes, and are written in Ottoman Language. They were a beautiful and symbolic form of expression of the same ideas, but in different ways. Influenced by Sufi thought, divan was a highly ritualized art form. The Fih-i Ma-Fih (What is within is within) includes Mevlâna's lectures and spiritual discussions with his students. Rumi has inspired millions over the centuries, including most recently celebrity Brad Pitt, with Rumi's famous quotation tattooed on his arm : "There exists a field beyond all notions of right and wrong. I will meet you there".